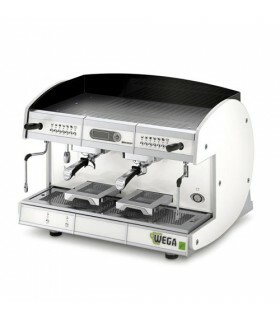 Electronic coffee machine with 2 groups, 4 programmable doses per group, including manual brewing button. Hot water tap with programmable electronic dosing. The Polaris EVD has four programmable doses per group and is completely customizable for your espresso needs. 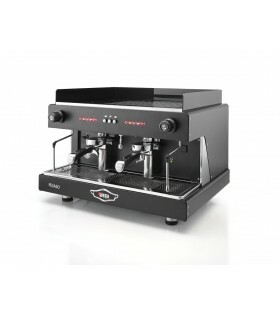 The sleek look of the Polaris is classy and adds a touch of elegance to any coffee operation. It comes standard with manual brew buttons for each group, two stainless steel steam wands (auto steamer is optional), and a hot water tap with mixing valve for temperature controlled perfect Americanos. Auto steamer version also has multifunctional alphanumeric display for date/time/temp/softener regeneration alarm/etc. It comes standard with built in, water cooled, adjustable rotary vane pump. Available in 1 (one steam wand), 2, or 3 groups in black only. Chrome package and auto-steamer are available as separate upgrades. Available in semiautomatic (manual) EPU and electronic EVD models and with 1, 2 or 3 groups. 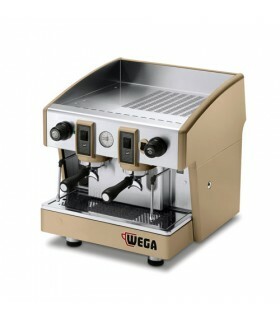 An excellent option for those applications with tight space for espresso equipment! This has all the standard options of the Polaris with a smaller footprint. 4 programmable doses per group with manual brewing buttons. One hot water tap and two stainless steel steam wands are standard with built involumetric rotary vane water cooled pump. Mixing valve for variable temperature control for hot water tap comes standard. Comes in 2 group, 220 volt only in black with chrome package available. 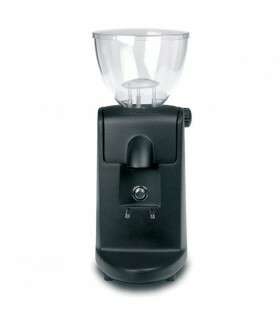 EVD: Electronic espresso coffee machine, with programmable volumetric dosing.